Michael Landy's meticulous etchings of urban foliage seem a dramatic departure for an artist best known for installations on a vast scale. Heidi Reitmaier finds the common thread that runs through his work and this issue's Artist Project. What do you do after a breakdown? It seems perhaps too obvious a question in the aftermath of Michael Landy’s most notorious public installation. Set in the ground floor of a temporarily abandoned department store on London’s Oxford Street between 10 and 24 February 2001, Landy, a well-respected and well-known artist of apparently good previous character, set about cataloguing and then destroying all his 7,227 belongings in a systematic, meticulous and, some might argue, faintly fetishistic manner. Break Down was an elaborate theatrical performance for which Landy devised a peculiar human mechanism. Each of his possessions was itemised and typified in one of ten categories: art, clothing, electrical equipment, furniture, kitchen contents, leisure, perishables, reading material, studio contents and motor vehicle. This process employed a team of operators who each day set about separating each item into its basic elements – metal, paper, wood, plastic or ceramic and so on, finally shredding or granulating them. The result was more than 5.75 tonnes of material, which was not eventually archived, preserved or exhibited or even sent to market, as might be expected from such a seemingly narcissistic act. Rather, it was deposited in landfill sites – a kind of disinterested urn burial. Across the world, from Tokyo to Arkansas, there was widespread media interest examining the motivations and virtues of a man willing to make such a grand and provocative statement against the image of himself produced by consumerism. He became an heroic icon for some, for others a madman and for others still (the panel of judges for the 2001 Turner Prize, in particular) he was an artist turned vandal – one able to sacrifice without care or concern works by other artists which happened to fall into his care. For Landy however, while it was perhaps unrepeatable in exactly the same form, Break Down was not simply a grand, one-off gesture. Nor were its intellectual and aesthetic concerns unique to it. Traces of his spectacular theatre began to appear as early as 1990 in Market, in the enormous east London warehouse gallery Building One (now closed). Scaffolding poles painted with red oxide paint, plywood shelves and artificial grass were used to replicate dozens of market stalls forming an empty market, without produce or people. It was something of a theatre of anticipation, a deserted set, an arena for the usual kinds of commercial and social exchange waiting for fulfilment in use. These familiar props, often seen idly passing time among themselves in the side-streets of London in their moments of unemployment, were here quite literally emptied of content. Yet they reminded visitors of the daily gestures of markets, their cast of characters, their day-to-day economies and small rituals of display, bargaining and exchange. It was easy to identify with this bold and paradoxical gesture that lent a formal nobility to a place and its transients precisely by articulating their absence. Here was the beginning of an identification with the mechanisms and contradictions of modern living. But Market is also a work that reflects on some of the conventions of modern sculpture and the kind of space it invents. The industrially standardised object-type and the deployment of minimalist art objects in the gallery space, the distance they need from each other in order to be able to breathe and communicate, all played a part in conjuring up this air of nobility for a vernacular space. It is this ability of Landy’s to draw a range of aesthetic expectations into telling relation with the kinds of spaces we inhabit that has made him one of the most interesting artists to emerge in Britain in recent years. Twelve years on from Market, he remains interested in the discovery and restitution of relations to things that are usually left unidentified and disregarded. His recently completed commission Nourishment continues with this theme, though in a rather different way; one which reflects particularly on Break Down. 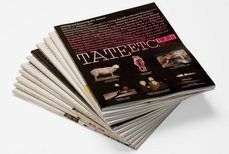 Nourishment is a series of limited edition prints, an exhibition and a set of pages created for this issue of Tate magazine, and it represents an exploration of the parameters of what constitutes an artwork. For the past two years, Landy has been botanising in little urban margins, looking for their earliest colonising flora as well as the longer standing floral residents. Collecting weeds from urban brownfields, from cracks in pavements and the corners and verges of car parks, he has kept them fed and watered and has spent hours drawing each one, first on paper then on copper plates. The result is a series of etchings – little florilegiums, not exactly garlands – that seem to refer back to artists of the Renaissance, such as Albrecht Dürer, as well as to botanical illustrators of more recent centuries. More importantly, these images play out a contemporary vernacular aesthetic that is Landy’s own distinctive contrivance. There are certainly similarities. Ultimately, they manage to marry a form of personal mediation – acquired through hours of studying the rescued plants – and a gathering and cataloguing system as functional and mechanistic as seen in his past work. Landy has managed to avoid any overly romantic references to the canon of high art by sourcing textual information and visual references solely from botanical guides and dictionaries. At the time of the implementation of Break Down, Landy had been referring to such books; yet inevitably they became caught up in Break Down’s logic, destroyed, and he has since remarked wryly that of course he has had to find replacements for such titles as Garden and Field Weeds by Roger Phillips or Francis Rose’s The Observer’s Book of Wild Flowers . Much of Landy’s work broaches a dialectic of history and the present, of politics and art. For many, Break Down epitomises this. A directly subversive act performed on the cusp (perhaps) of international recession and during a rise in global political activism, Landy’s work asks questions about consumerism, entitlement and capitalism, as well as about the role of artists and their productions.